Francesca Avalli is a pediatric OT who was looking for a creative way to engage the children in her clinic in upper-body/core strengthening and play. When she couldn't find the right tool, she set about creating one. The solution Francesca created is the Handee Band, a exercise kit for children 3-6 years old. The kit features 15 upper body and core exercise, led by adorable monsters. The kit also includes a resistive yellow band with handprints for where to hold it, a checklist with a dry-crease marker and stickers. I connected with Francesca through the recent AOTA Expo. (I swear the more I blog, the more I am blown away by all of the OT innovators out there!) She agreed to be interviewed about the creation process and the ways she sees her product being used by OTs, parents and educators. Hats off to Francesca, for seeing a need and doing something about it! What made you decide to pursue the creation of the Handee Band? I want kids to be independent and feel confident about their little bodies! When working in a preschool in the public school system, I realized I needed something fast and easy to help kids with their posture and strength, so teachers could do it with their students when I wasn't there. Kids love books and pictures and the hand prints on the band help them do the exercises independently. Life is so busy and parents and teachers are overwhelmed and want something easy to do that helps their kids get stronger and the Handee Band does that. Everything from the pictures to the way the book stands as an a-frame is so well designed! Can you tell me a little bit about the production process? Thank you!! I wanted to make things functional, small and compact, all in one, and easy to use. The a-frame tripod book helps the kids already put their bodies in an extended position, rather than looking down, like you would with other books or electronic devices (iPads, smart phones, etc) and it is easier for kids to use it in groups while they are all looking along and following the exercises. I wanted everything kept all together with the band and pen in the vinyl bag, so it is also easy to keep in the classroom without things getting lost or for a parent to take in the car or on a trip. 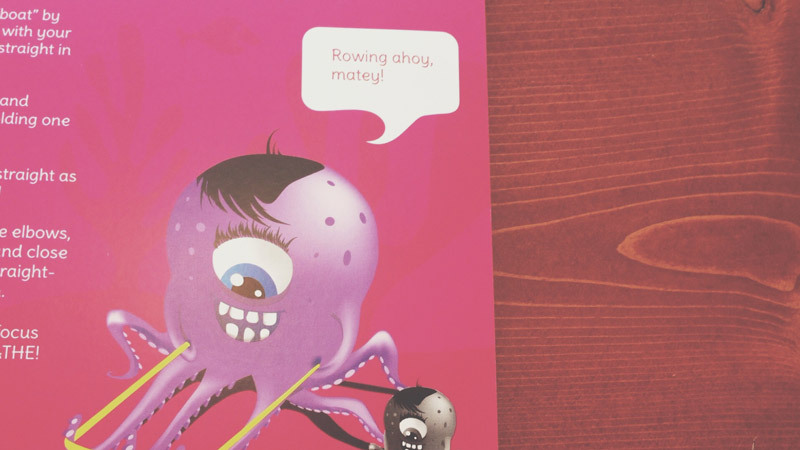 Kids love monsters and sea creatures, action heros, and transportation. I wanted the characters in the book to engage the kids and help their imagination soar even more, while getting stronger at the same time. I am all about trying to make life as easy as possible, while getting the job done! How are you using the Handee Band in your own practice? In my practice, I work with kids individually and I use Handee Band as a warm-up before we get started with other sensory motor activities. I use it as a reward, especially because they love working for the stickers and checking off the checklist. I also use Handee Band as platform for drawing, handwriting and motor planning, and coming up with even more ideas with what the characters might be doing. We talk about safety with one of the characters and "buckling up" and pretend to be pirates or race car drivers. The possibilities are endless when you have pictures that get the kids pretending! What kind of reaction have you had from the kids who are using it? The kids get very excited to look at the pictures and do the exercises so they can check off the list. They want the stickers and they feel proud when they have done an exercise. It is natural for them to play and pretend and when they can combine that with exercise and getting stronger, like a super hero, then they feel good about themselves and want to do more!!! They remember the characters and choose which exercises they want to do. When we do groups, kids also want to be the leader and demonstrate the exercises to one another. Do you an example of a success story of a kiddo or group who has particularly benefited from the Handee Band? I have lots of kids that benefit from working their muscles! I have had children who don't want to exercise, start to exercise with the Handee Band Exercise kit, and then do more because of how excited they are about the characters. I have heard lots of stories from therapists that use the Handee Band that their kids love it! I feel like anytime a child starts to feel good about what he or she can do and smiles and wants to do more Handee Band exercises is a great success!!! Do you know of any examples of the Handee Band being used by groups in the classroom? I have coaches and PE teachers using the Handee Band kit with their kids to "warm up" their bodies. Swimming teachers and speech therapists are using the kit. Classroom teachers love to use their Handee Band kit with their entire classroom during circle time and before their transition to table top tasks. It takes the guess work out of exercise and strengthening for them and keeps the kids interested and motivated. How can the Handee Band help kiddos achieve their academic goals? Kids need to sit upright to be able to participate in academics and the Handee Band helps children with their postural control and their upright stability to sit in their chair and during circle time on the rug. The Handee Band increases shoulder girdle strength needed for fine motor control, so holding a pencil and coloring or using a glue stick and cutting is easier. The Handee Band also provides sensory input to help calm children and increased their ability to organize their behavior so they can attend and learn to achieve their academic goals. What resources would you suggest for parents and teachers who are just learning about the value of proprioceptive feedback for pre-schoolers? I think there is a lot out there that can become very overwhelming for parents when learning about proprioceptive feedback for pre-schoolers. I always suggest starting with asking an occupational therapist at your school or an occupational therapist that you are working with for the most individualized information as possible. Jean Ayres and her book, Sensory Integration and the Child can be helpful to specifically read about the proprioceptive sensory system. Sensational Kids by Lucy Jane Miller is also a great resource for families. Then I would suggest trying to think about things in your every day life that are calming and re-organizing for you. What helps you feel calm during a stressful day? What do you need to do in order to help with your attention or getting work done? It all starts with self awareness and when we are more aware of what can help ourselves, we are more aware of how to help our kids. For more information, check out Francesca's website at Handeeband.com. MamaOT also has a great blog post about how to use the Handee Band to help preschoolers with sensory and motor skills.